"We have the ability to do things end to end," said Bill Fairfull, co-owner and co-founder of Simplicity Solutions Group. "We excel at the design phase, and then on the back-end, we also do Enterprise Development. We cover the full spectrum. Not a lot of companies can go from design to delivery and do it all in-house." Founded in September of 2013 by brothers Bill and John Fairfull, Simplicity Solutions Group specializes in web design, software development, hybrid mobile and custom web apps built on their proprietary application framework. Their team has years of experience in everything from logo design to business process analysis. They also specialize in RFID and RMS middleware and software. Their product line represents an entire technological ecosystem that allows businesses to make strides in productivity, organization, marketing and quality assurance. Before he decided to go into business with his brother John, and combine their individual areas of expertise, Bill spent a lot of time in the areas of records management, document conversion and microfilm. He had a big operation in Longwood, Florida. He helped local counties and cities such as, Lake County, Palm Coast, Jacksonville, Orlando, Palm Beach County and more with their large scale back-file scanning conversions. He worked with building departments and helped drive their electronic permitting and online permitting systems. Bill also had clients at the federal level, including the International Monetary Fund and the Department of Health and Human Services. 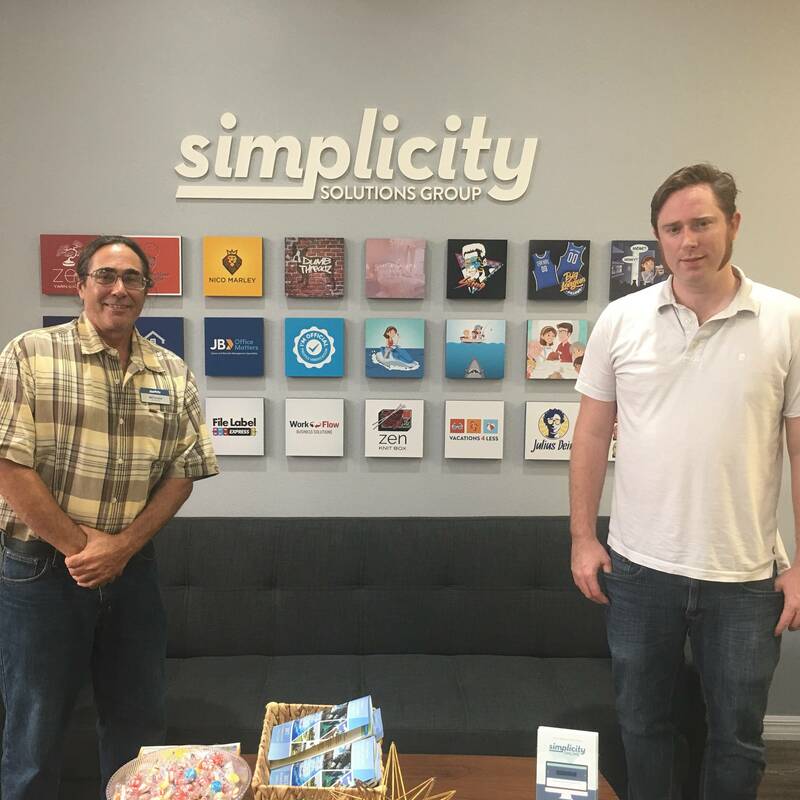 When the brothers first founded Simplicity Solutions Group, they were originally located in Sanford, Florida. Bill shared some early challenges they had to work through and others that led to new opportunities. "Funding was a big challenge," he said. "In order to make a name for yourself, you need some demonstrable results. We decided that the website development segment was the easiest channel to break into to start getting results. Even though we had great references from John's previous business, it was still a challenge to find the right people to get in front of. Once we did, and started to develop a good reputation, our next challenge was to scale up. Going from three people to 15 was and continues to be a challenge. You can't afford to be wrong about the people you hire. If we are, we're quick to remediate it. As we started to scale, we left our original location and moved into a bigger space in Orange City. The move provided us with an opportunity to plug into the business community in Volusia County. We've had a lot of success since we made the move." For Bill, the freedom to have an idea, make a decision, take a risk and potentially be rewarded is what he loves most about owning and running his own business. The only thing that binds him is whether or not he has the capital to pursue an idea. The most challenging part, according to Bill, is managing employees. "You have to like the people you work with," he said. "If you walk into your office and you can't stand to be with them, there's no way to hide that. If your people buy into the concept of a team, they like you and they like each other, you're going to have success." Bill's five year plan is to provide his clients with a total business platform. He wants to help his clients with their digital presence and business applications all provided on the same framework. Simplicity Solutions Group will continue to target the small to medium sized business market with cost effective and individually tailored solutions. They're also driving hard into the 'Internet of Things' market. "We're going to expand and provide a lot more business metrics," he said. "Things we could have only guessed at in the past." Bill offer's up some great advice for anyone looking to start a business of their own. "The best way to start a business is to start a business," he said. "Just go do it. Don't parse around about it. Sure the risk is there, but that's why they call it 'risk/reward'. Also, if you can afford to leave your day job, great, if not, keep it until your new business takes off."